Carving is not an art. It is a craft. It has distinct utilitarian purposes: Serve the meat so when eaten it is most tender, juicy, visually appealing, and reduces waste. The most important concept is to slice across the grain. 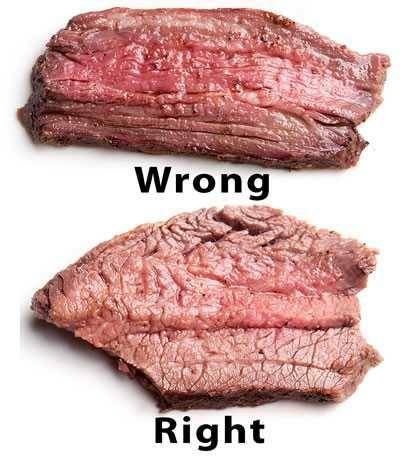 You can make meat more tender by carving it properly. The basic concepts are simple: (1) Cut meat perpendicular to the grain so you can chew parallel to the grain, and (2) thin slices are easier to chew than thick slices. Start by making a note of which way the grain runs when it is easy to see the grain, when the meat is raw. 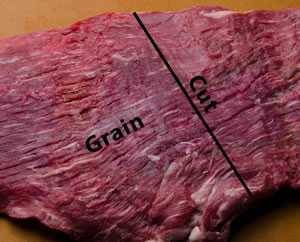 Look at the obvious grain in the flank steak, below. It runs from lower left to upper right. So the knife goes from upper left to lower right, parallel to the black line. In the photo to the right, the top slice is cut with the grain. It will be stringier and harder to chew. The bottom slice is cut properly across the grain and thin. It will be easier to chew. My article on steakhouse steaks contains tips on carving large steaks, and my article on turkey contains tips on carving poultry near the bottom of the article.